You can't please them all, as they say, and this is particularly true of titles like Entwined, which speaks quite loudly to some players, and is a complete waste of time for others. Entwined doesn't have a terribly broad appeal, and our own Jim Sterling gave it only 3 out of 5 stars. I had a wholly different experience, however, as did the few folks I saw playing it on the show floor. To some, it's just another pretty art game. Jim, for instance, plays dozens of games every month. Just look at the reviews he puts out on a weekly basis and you'll see just how many games he plays. I don't have the breadth of experience that he does, so I'm far from being soured on this sort of experimental game designed to be more experience than gameplay. Anecdotally, I found the Entwined station at the PlayStation booth at E3, and found four players all enthralled with their experience. I stood there patiently for several minutes, waiting for one of them to get bored and move on. Nobody did. So I found a PlayStation employee to get the scoop, and it turned out this was a common trend during the show. I stood, all told, a minimum 20 minutes, waiting for just one of the four people to get tired of the game. With E3 going on around them, Call of Duty, Battlefield, Splatoon, and every other imaginable title, franchise, or company being just a few steps away, these four good folks didn't want any of it. They wanted to experience Entwined. Fortunately, I had an appointment to see Entwined on Thursday, so I meandered on for the time being, having taken from this wait a glimpse of the game, and some insight into how it was being played. When I finally got to play it myself, I was prepared to fail miserably. I'm not the most dexterous person, and I'm particularly bad at using the DualShock, but I dove right in, and found my footing quite easily. I played for several minutes while chatting with the gentleman showing off the game, when he finally asked if he could put some headphones on my so I could experience the game as it was meant to be played. The audio completely transformed the experience. What was before mostly just an exercise in control acuity, now felt more like an actual experience. The interplay between the soundtrack and the gameplay reminded me of Chime from a few years ago, where your entire soundtrack was dictated by your actions on the screen. 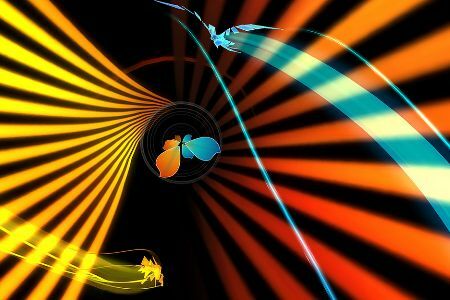 With gorgeous visuals and a thoroughly satisfying soundtrack which seems to take cues from your performance in game, Entwined might not be a game for everybody, but if it looks like your kind of game, then it probably is. If you're an incredibly prolific game player, however, then you might take Jim's advice and steer clear until it goes on sale.